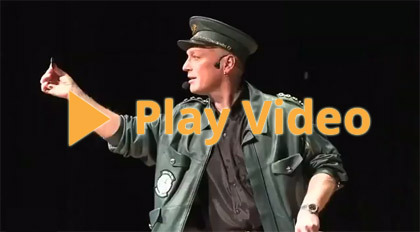 Captain Green spellbinds the younger generation between 5-12 years with a deligthful program of at least 40 minutes. His show is especially adapted to children. The youngsters are asked to assist Captain Green to do his tricks successfully. Together they develop e many magical tricks with surprisingly colourful effects, which even adults can not easily figure out. Sometimes a guest-star will suddenly arrive (in fact a stowaway at Green-Air): "Rocky Racoon", and he performs together with Captain Green! Captain Green says: "Children are the most critical spectators. If they have discovered something about a trick I am at their mercy with an uproar. But if I succeed – they are finally the most thankful people at my shows!" The air passengers comment: "Childrens' shinning eyes show the greatest awe!"